Search engine optimization (SEO) consists, at the simplest level, of three things: knowing your target keywords, optimizing your content around those keywords and building inbound links from relevant external pages. That doesn’t sound so simple, does it. I’ll break down these three points and expose my experience optimizing my wife’s site for her acupuncture practice in Chicago. To kick things off I went to Google’s webmaster tools and added her site to my account. Starting off with the webmaster tools is important because the data in there will tell you how well your site is doing prior to you making any adjustments. You’ll get a baseline perspective. Eventually, as you make changes, you’ll see the impact in the reports. We wanted to choose keywords that were relevant to her business, but it’s helpful to know what people are searching for to find her business today. Looking at the Search Queries report (under the Search Traffic section) the baseline for my wife’s site showed that she was showing up in search results 25 times a day. 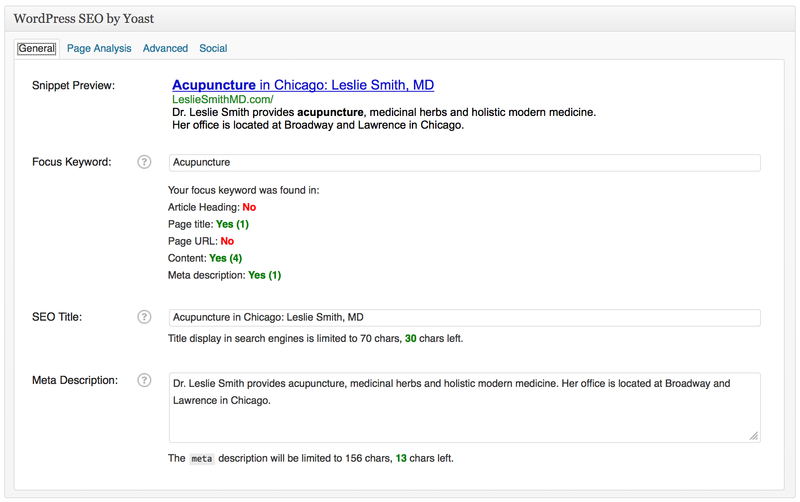 Only 11 keywords were shown to be relevant to her practice. Most of the keywords were related to her name. This makes sense because the domain is a reflection of her name, LeslieSmithMD.com. It turned out that this wasn’t a good source for reinforcing our keyword decisions. We have been using Google’s Adwords product to advertise in search results. Looking through the stats there, I found that the most significant performance revolved around two words: acupuncture and Chicago. They also showed up in the webmaster tools, but they didn’t look significant in that context. These words, however, would be my primary target for the homepage of her acupuncture site. There are other pages on her site that have specific topics, like needles, moxibustion and cupping. For those secondary pages the keywords are obvious and, to some degree, less relevant. The content is great for rounding out her site and informing her potential patients about the treatment techniques that they might be exposed to. Ultimately, though, there aren’t going to be very many people who are seeking treatment quite so specific in a search engine. Once we established our target keywords I needed to optimize the homepage to increase the relevance relative to those keywords. I needed help, though. The old days of winging it with what I think I know wasn’t going to cut it. I looked around for a helpful WordPress plugin. Sure enough, there was a good one with solid reviews. It’s called WordPress SEO by Yoast. Once SEO by Yoast is installed, you get a new configuration block on ever page edit screen. There are two important tabs: General and Page Analysis. The first thing to do is set your Focus Keyword on the General tab, then you have to save the post. 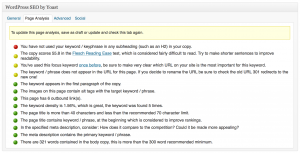 This allows the plugin to analyze the page’s performance against that keyword. Once saved, clicking on the Page Analysis tab will tell you all the things you need to do in order to optimized the page for the Focus Keyword. Don’t just throw your Focus Keyword in odd places. Make sure it makes sense in context. The analysis will tell you to add an image if you don’t have one, adjust your writing to make the content more readable and 11 other things. Getting a passing score on the analysis means getting most of them to turn green. On some pages it’s difficult to make every check light up. We had two keywords: acupuncture and Chicago. So after I optimized for one, I change the Focus Keyword to the other one and re-optimized. 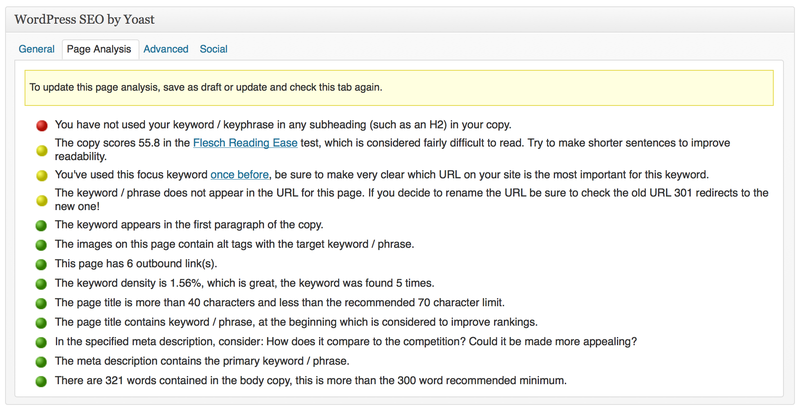 I followed up by optimizing most of the other pages for the relevant keywords to those pages. As a result of my efforts, Google’s webmaster tools are showing that we are showing up in more 40 keyword searches and more than 50 times a day. For our target keyword combination of acupuncture and Chicago, we went from showing up in the 90th position, to showing up in the 40th. We can get more results by executing on the third component of SEO: link building. This is quite possibly the most difficult component. The idea behind link building is that you find content on other sites that is relevant to yours, and you get that site owner to link to your site in some way. Usually you’d want it to be near a keyword that you’re interested in. You’ll notice at the top of this post I have placed a link to my wife’s site. Do the words in the link look familiar? 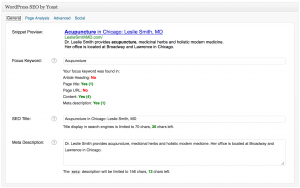 The site is listed in significant professional medical and acupuncture indexes already, but there aren’t many of those. So I’m on the hunt for high-quality sites that have relevant content. 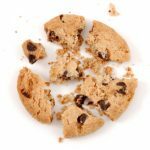 I’ve found a lot for-pay listings out there, but they seem to be geared toward increasing their own relevance, rather than the relevance of our site. So those are the three basics of SEO for small business using WordPress and Google. There are a bunch of other things that can be done and I’m all geared up to get those going, but we’ve put the breaks on doing too much for the moment. You see, my wife’s practice has been booked solid every week all month. Most of the credit goes to her. She’s a brilliant networker and amazingly personable. She’s also a brilliant healer. She gets tons of referrals. But she also gets a fair amount of cold-calls and online bookings from folks who have found her on the Internet. We’re hoping that continues… but just enough. Is Google out to destroy the secondary keyword market (before it has even matured)?